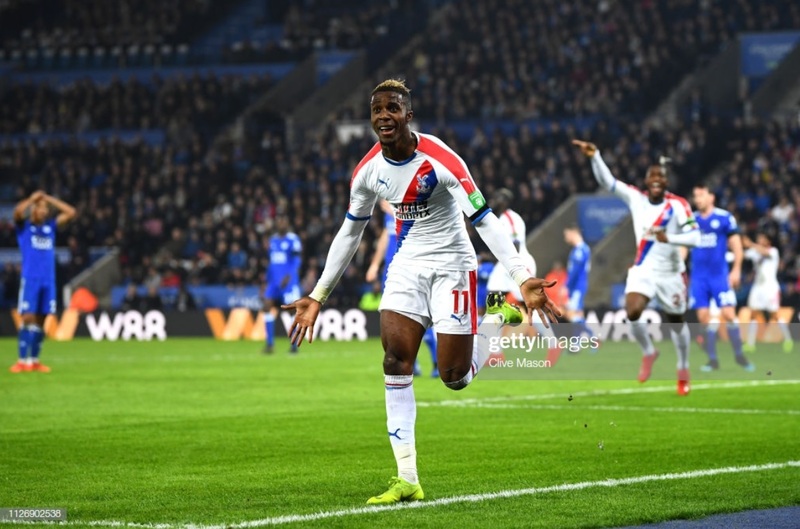 Crystal Palace earned a huge boost in their task for Premier League safety with a impressive 4-1 victory against Leicester City at the King Power Stadium on Saturday evening. It took some good fortune for the Eagles to take the lead as they absorbed plenty of pressure in the first period before Chelsea loanee Michy Batshuayi opened his account for the club as he deflected James McArthur's strike past Kasper Schmeichel. Claude Puel's men replied just past the hour as Jonny Evans speared home an equaliser. That was as good as it got for the hosts as Wilfried Zaha fired in at the back post only a matter of minutes later before Luka Milivojevic extended the lead from the penalty spot. The points were all but wrapped up in the closing stages by Zaha as he robbed Harry Maguire and fired past Schmeichel. Leicester might have felt slightly unfortunate to be behind at the break as Harvey Barnes, James Maddison and Youri Tielemens all forced solid stops out of Vincente Guaita. Jamie Vardy was also unlucky to lift a header just over the bar, whilst Mamadou Sakho blocked a Maddison strike that looked destined for the top corner. Claude Puel's men then had shouts for a penalty as Barnes was fouled in the area. The referee was unmoved however and Palace took advantage as they broke up the other end of the field. McArthur set his sights, with his low shot taking a deflection off of Batshuayi and wrongfooted Schmeichel. Despite the Foxes' dominance, they struggled to find a way beyond a stubborn Palace rear-guard until Evans showed the instincts of a striker to power home Barnes' low cross from inside the penalty area for his first goal in a Leicester shirt. The hosts were level for only six minutes as Zaha latched onto McArthur's fantastic cross at the back post to place the ball into the bottom corner. Evans, the hero at one end, was then the villain as he took down former Fox Jeffrey Schlupp in the penalty area. Milivojevic stepped up and sent Schmeichel the wrong way to give Hodgson's men some much-needed comfort. The pressure heaped on Puel in the closing stages as Zaha picked up a loose pass from Maguire and raced towards the Leicester box. With just Schmeichel to beat, he powered a shot through the Dane, triggering a mass exodus from the stadium. As a result, Palace are now six points clear from the bottom three, whilst Leicester are now only one place and two points better off ahead of another home clash with Brighton & Hove Albion on Tuesday. It could be fair to suggest that Puel is under severe pressure at the King Power Stadium. Leicester have now lost three Premier League games on the spin and could well be sucked into the relegation dogfight. The Foxes are now only eight points above the drop zone and the fans appear to have turned on the Frenchman. Following the final whistle, the stadium was practically empty and Puel now faces a huge task to get them back onside between now and the end of the season. Coming into the match at the King Power Stadium, Serbian powerhouse Milivojevic had already earned the Eagles seven Premier League points. He again put in a majestic showing in the East-Midlands, finally securing the points as he confidently dispatched his penalty into the net. Signed from Chelsea in January, Batshuayi arrived at Selhurst Park with the task of scoring the goals to keep the Eagles in the Premier League. He will no doubt then be delighted to be off the mark in Palace colours, albeit with a deflected strike. That goal will take a weight off of his shoulders, alongside a confident performance. The Belgian will now be hoping to continue that positive form until the end of the season. Luka Milivojevic. The Serbian midfielder was excellent at the King Power Stadium. Despite Palace being on the back foot in the first-half, he was the man to keep cool and wrestle control back for Roy Hodgson's men. Not to mention, he also scored the crucial penalty to all-but secure the points for the Eagles.